Bethel Park High School Honors Biology students are looking at ways they can help honey bees. Challenged by teacher Mr. Winschel to focus on developing ways the bees can conserve energy so they have more time to pollinate flowers and produce more honey. Students worked in teams to design a honeycomb on CAD and use the 3D printer in their classroom to print out their designs. Student-produced honeycombs were taken to Mr. Winshel’s home and inserted into a bee hive containing 40,000 honey bees. 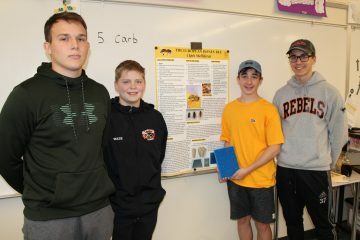 The students also did research and created posters about the honeybees. Mr. Winschel also is making video presentations for two of his groups and entering their projects into a national STEM design competition sponsored by the University of Pittsburgh and the National Science Foundation, with the winning group receiving laptop computers. The students were surprised to learn how important honey bees are to the food supply and that their populations are decreasing, due to issues such as industrial agriculture, parasites, pathogens, destruction of habitat and pesticides. Mr. Winschel’s students were excited to participate in this project that may have a positive impact on the honey bee population.